The situation which has developed between Ukraine and Russia, wherein Russia without justification has aggressively brought in forces onto Ukrainian territories has to be solved without bloodshed. And in order to do this, all possible means have to be tried, because blood-shedding is ultimately a terrible thing which can be very dangerous and very terrifying. 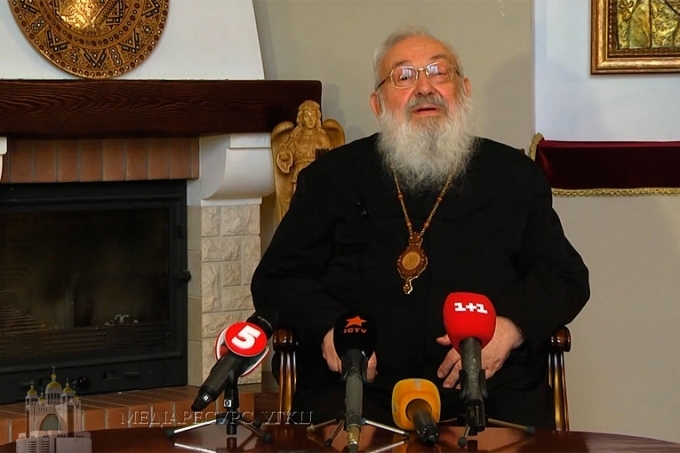 These contentions were expressed today by Archbishop Emeritus His Beatitude Lubomyr (Husar) in speaking with journalists. The hierarch reminds everyone that in an armed conflict a lot of totally innocent people die. In fact, a far greater number of innocents perish than those who are armed. “Unquestionably, when there is aggression, each one of us has the right to defend oneself -- that is normal. However one has to try all possible means in order to make sure that this does not happen,” emphasized His Beatitude Lubomyr. Simultaneously, His Beatitude Lubomyr is not proposing solutions, saying that there are competent Ukrainian officials to do this. “One who threatens to fight with a sword, has to remember that the sword may turn around also against him. And here God is the judge. The lives of other people are ultimately under God’s care and God directs all. And to consider purely human achievements, without considering that God is the ruler of human life, is lighthearted,” he noted. “Whoever fights with a sword, can also die from the sword,” mentions the spiritual leader of Ukrainians.